On Saturday, Aug. 9, Troop 50 Scouts, leaders and families made the troop's now-annual pilgrimage to Lake Martin, where thanks to the Adams family, everyone enjoyed a relaxing lakeside day. The annual "Chill at the Lake" event is a product of the troop's inaugural troop planning retreat, where Scouts indicated they wanted a summertime event filled with lots of fun and less knot-tying and tent-pitching. At the troop's 2014 planning retreat, Scouts unanimously requested another summertime lake event, so the tradition continues now for the second year. Turn Up Patrol Leader Andrew was one of several Sea-Doo lake tour guides. While parents had the opportunity to socialize, Scouts hit the lake to swim while also taking turns touring the lake on the back of a Sea-Doo. Many of the troop's newer Scouts also found some time to meet with Scoutmaster Baird for their scoutmaster's conference — the last step in their efforts to complete the requirements for the Tenderfoot rank they started as part of their summer camp advancement efforts at Camp Woodruff. Grillmaster Schallock flipping the burgers! Thanks to the efforts of grillmaster Bill Schallock — and the many at-home culinary creations of families who brought side dishes and desserts — everyone present enjoyed a great lunch of grilled hamburgers and hot dogs, complete with all the sides. As lunch came to an end, the first of two bouts of rain rolled in, so everyone took temporary refuge inside. Assistant Senior Patrol Leader Davis! As the rain cleared, Scouts returned to the lake like ducks to water. After being ferried via a couple of short pontoon boat rides, Scouts put their acrobatic skills to the test on the lake's nearby rope swing. 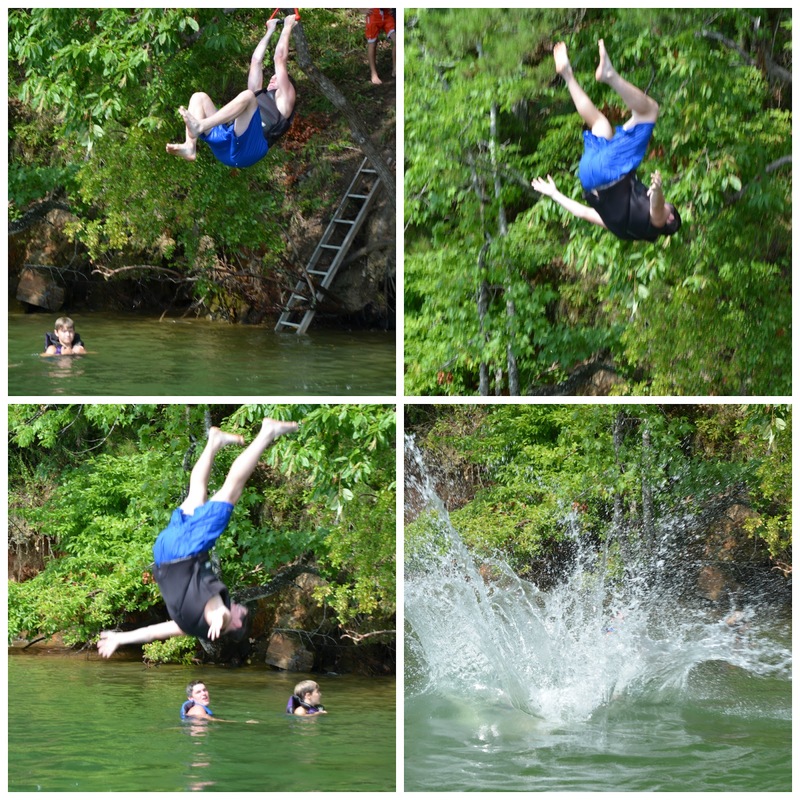 The parents who watched from the pontoon boat were well entertained by the Scouts' flips — and flops — as Scouts launched themselves from the shore. There were some Olympic-style moments — and others that Scouts' noted were best suited for the bloopers reel of the television show "American Ninja Warrior." Flipping and flopping continued until it became evident that the lake was due another wave of showers, so everyone headed back to the house and departed soon after. The troop is again thankful to the Adams family for the chance to fellowship at the lake and kick-off the start of another great troop year! For more photos — and even some video — from our annual "Chill at the Lake," visit the troop's online photo album.